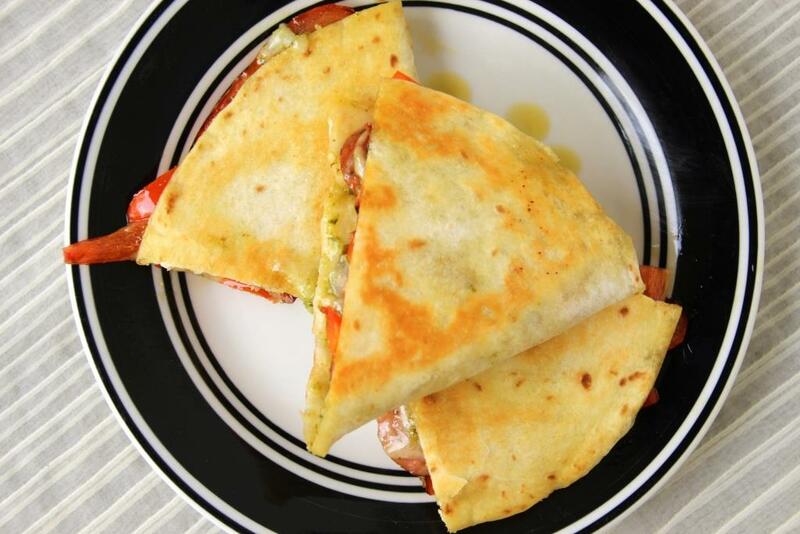 One of my go-to quick lunch and dinner options is the ever-faithful quesadilla. Delicious with just plain cheese or dressed up with whatever veggies and meat I have on hand, it’s quick to put together and reasonably healthy assuming I don’t go overboard with the cheese and sour cream. Served with a salad it’s a well-rounded meal while still being less than 20 minutes from conception to consumption. My standard concoction involves the usual flavors like cheddar, black beans, bell peppers, and possibly whichever ground meat I have in the freezer. Sliced olives are also great if M is not eating them and I remember I’m “allowed” to use them. These are things I pretty much always have around so it’s a great standby when I’m in a rush. Sometimes, though, it’s nice to mix up the old standbys with some new flavors. A favorite at a local pizza parlor and brewery inspired this particular flavor palate. They have many delightful combinations but one of my favorite Bridger Brewing pizzas is the pesto and lamb sausage. I’m always a sucker for sausage on pizza and the addition of pesto is a nice change-up from the usual white or red sauces. With a package of local Andouille sausage in the fridge and a Costco container of pesto demanding to be opened, I decided a fancier quesadilla experience was in order. Bell peppers go with everything, in my personal opinion, so I sautéed a few for added color and flavor. Since quesadillas cook pretty quickly, I opted to warm my sausage slices beforehand to ensure they were hot all the way through. 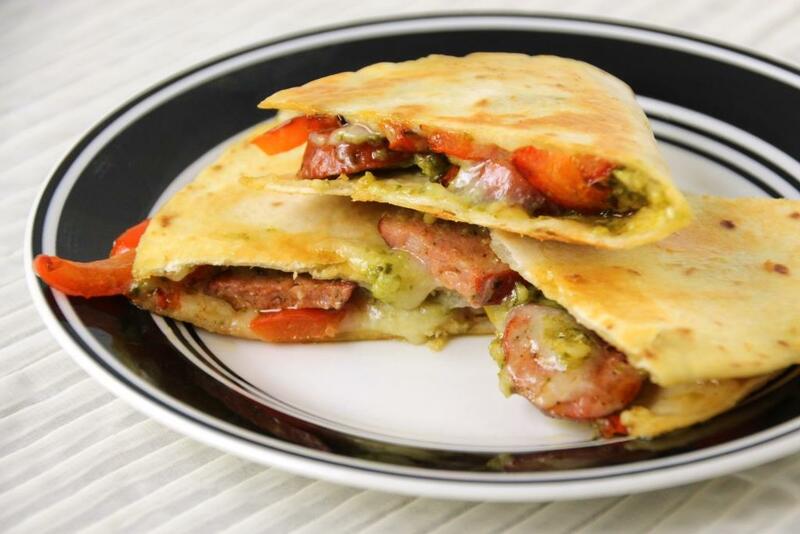 Layers of pesto, sausage, peppers, and melty cheese are delightful experience both in flavor and texture. 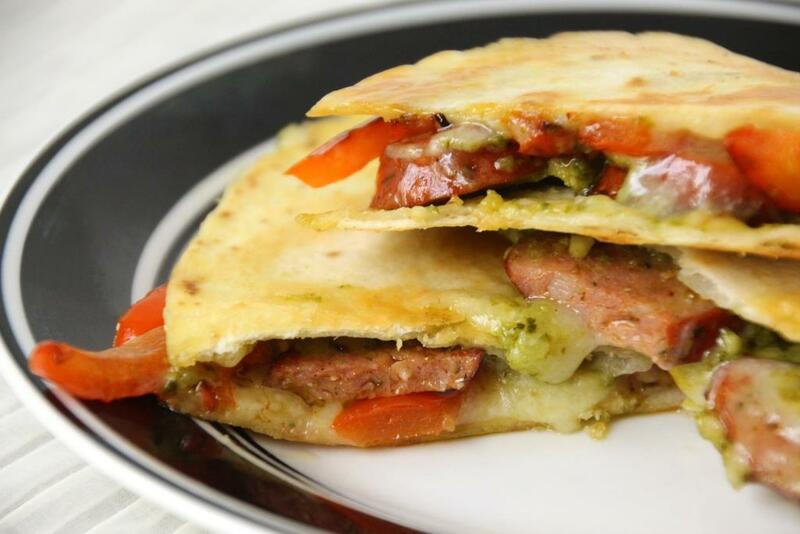 Mild cheese and spicy sausage, sweet peppers and a smothering of pesto come together for a great juxtaposition of flavors in every bite. This is not what I would consider a particularly healthy assortment as it’s pretty high in both oil and salt content, but it is delicious and a great treat dinner for what would be an otherwise casual evening. I served mine with a spinach salad to help balance the meal, and overall felt pretty great with the whole thing. The next time you’re looking to change up a standard favorite, try this one out, and let me know what you think. PS – you may have noticed this is neither dessert nor a cake. I have not yet had time to photograph last week’s delightful dessert, but never fear it will be on this blog someday. Spread half of each tortilla with 1 Tbsp pesto. Set aside. Slice the sausage into approximately 1/4″ slices. In a medium or large saucepan, heat sausages over medium-high until warmed through (no need to add oil, just add them to the cold pan while it warms). Remove sausage from pan, and set on a paper towel. Remove peppers from the pan and set aside with the sausage. Wipe the excess oil from the pan and reduce heat to medium. Flip and fry one more minute or until the other side is golden. Repeat steps 7-10 with your other tortilla if you didn’t have room to cook them simultaneously. Slice each half into 2-4 pieces and serve immediately. 1 I find them much easier to flip when they are folded (and usually I’m only making one half), so I cook mine in halves. Feel free to make one large quesadilla instead if you prefer.